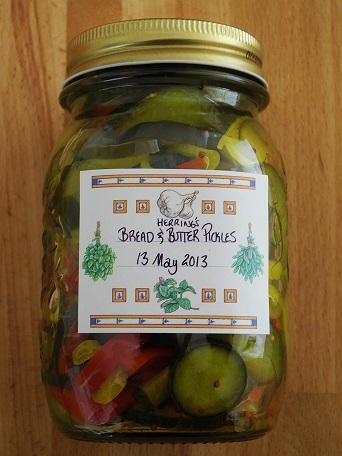 These pickles are one of my favourites, and I made them a fortnight ago. The recipe comes from the same Kansas-farmer grandmother as “The Best Cookies You’ll Ever Make,” and they are one of my comfort foods. There are hundreds of “bread and butter” pickle recipes out there in cyberland, so I’ll describe their taste: Sweet with a savoury aftertaste and sometimes just the opposite (think sweet & sour sauce), perfect for hamburgers, sandwiches, tuna salad or straight-up! They’re easy to make, and what I love most about them besides their taste is that fact that I know exactly what’s in them – no chemicals I can’t identify, preservatives that I can’t pronounce, or ingredients that are undeclared. Combine all, bring to boil, stirring & lathing frequently. Simmer about 20 minutes (depending on how crunchy you want them). Pack into clean, hot jars, cleaning the rims of the jars off if necessary, and then seal at once. To Seal, screw the lid on tightly, place in a sink ½ full with hot water, and let soak; the jars will seal themselves with vacuum within a few minutes. This recipe makes 5 average-sized (pint, or 1/2-litre) jars. Advice online can be a dodgy business; one person’s goat is another person’s pet, junk vs. treasure, and all that. As with anything, it should be taken with a pinch of salt. Or in cyber world terms, with a bit of personal research tossed into the recipe. Pictured here are a set of spoons I use regularly, made from olive tree wood. 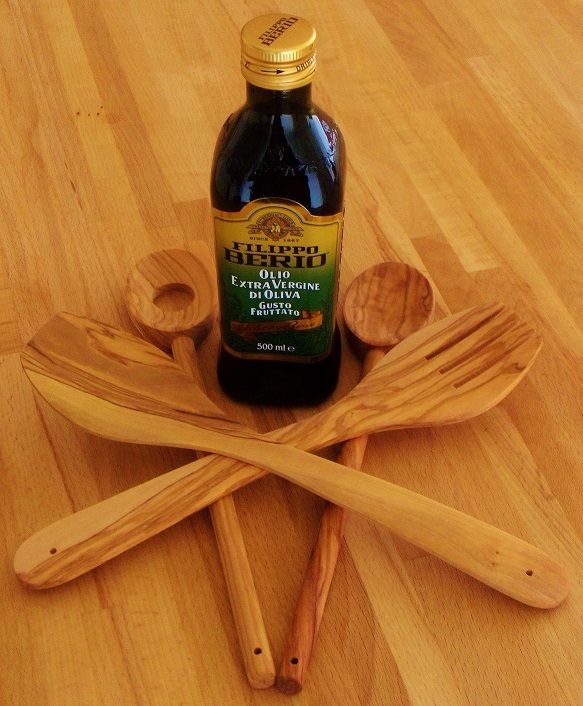 Now if you’re like me, you’ve had wooden spoons or other utensils over the years that, after a lot of wear, tear, washing and drying, they start to look splintery, dry, and even cracked; a good curry or dish of black rice can stain the wood next to permanently. Just doing a Google-Image search for “recycling wooden spoons” gives you ideas galore; but it also tells me that there are a lot of wooden spoons out there that have been used beyond their prime, and most chances are they were never cared for to keep them in their prime. To give the spoons a treatment, this is what I do: After using, wash the spoon and let it air-dry thoroughly; I usually leave it in the drying stand overnight. Before putting it away, take a paper towel and a drop or two of olive oil (you may need more, depending on how thirsty your wood is), and rub it into the entire utensil – top to bottom, sides, and if it’s a fork like the one shown, fold the paper towel between the tines. Take a fresh paper towel and give the utensil a good rub to remove any excess oil. If your utensils have already begun to splinter or are stained, you can smooth them down again with a piece of fine sandpaper before washing them. 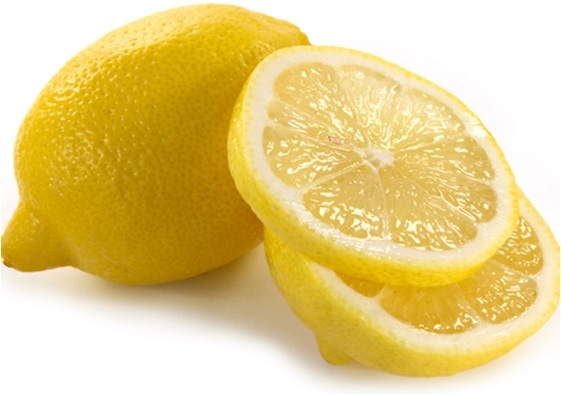 I’ve been using the salted lemons in any savoury dish calling for either lemons, lemon juice or lemon zest, or lemon grass. I’ve diced them about the size of a half-pea, and they taste amazing, even as-is!! This is definitely a keep-on-hand ingredient, and I’ll be making another batch before I run out! If you haven’t tried them, but you like citrus zing in your foods, this is a must-try! I’ve also filled a small jar with these diced, topping it with some of the juice from the batch; I keep it in the fridge for a quick condiment at the table for guests to add as they like. That may seem like a presumptuous title; after all, everyone thinks their cookies are the best, right? But I have yet to come across another recipe that evokes the responses this one does: I made them this week, and after one bite a guest asked if I would give his wife the recipe! I’ve had people groaning with pleasure after the first bite, and they’re seriously addictive, as light as air, and melt-on-your-tongue delicious. But what makes these cookies so special to me personally is the story behind them: My paternal grandmother, Mary Mae Herring-Higbee, was a Kansas farmer’s wife; she crossed the prairies with her parents in a covered wagon around 1902 as a baby, and they settled in the wild prairies of Kansas, where she met my grandfather and set up house. She lost seven or eight children before my father came along when she was 40, and he remained an only child. She was a no-nonsense pioneer, a teacher in a one-room schoolhouse in a town so small that if you were driving through it at 10 miles an hour and sneezed, you’d miss it (really). These were her cookies. When she was baking these even the air was edible they smelled so good, and I burnt my tongue on several occasions because I couldn’t wait for them to cool to take the first one. Being the simple farmer’s wife she was however, she figured everyone knew how to make these so she never wrote the recipe down, and took it to the grave with her. One day as a teenager I determined to figure out the recipe before it faded from my memory, and spent all day trying to find the secret ingredient and combination that makes them melt on the tongue. I was at the end of my rope, batches of failed (but very good) cookies up to my eyeballs, when in walked my brother, hands stuffed into his pockets. “Watchyadoin’?” When I told him, he casually tasted a cookie and said, “You don’t have any applesauce in ’em” and walked to his room. I didn’t know whether to strangle him or hug him. 3/4 can (average size) apple sauce – should be added until it lightens the dough colour & texture; not drippy, but light and viscous. Drop onto a baking sheet by the spoonful, far enough apart (they will spread a bit while baking). Bake @ 190°C for 10 minutes, or until glazed light brown. While they’re still hot remove to a cooling rack with a spatula that’s large enough for the cookie – they’re especially soft while warm. Makes 2 1/2 dozen palm-sized cookies. 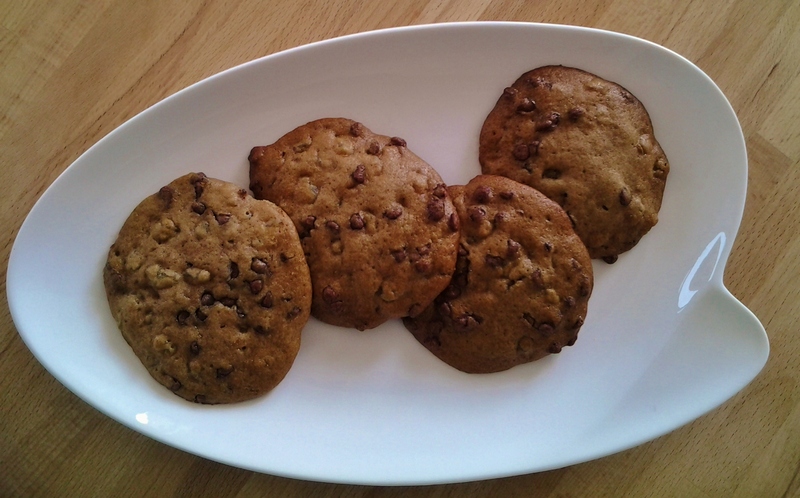 * If you toss the raisins and chocolate chips in the flour before adding to the liquid ingredients, it prevents them from sinking to the bottom during the baking process. 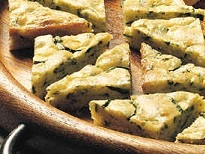 This recipe was originally from Betty Crocker in 2007; I got hold of it, improved it (as shown here), and it has become a staple „go to“ recipe for parties or as an appetizer. 1. Heat oven to 350°F (180°C). Grease bottom & sides of a rectangular casserole dish. 2. Stir together all ingredients. Pour into the pan and spread evenly. 3. Bake about 30 minutes or until golden brown. Cut into 2-inch squares; cut squares diagonally in half into triangles.